Hope you are having a fun and relaxing break. I spent most of the day today sorting my own wardrobe for the upcoming season. It was a day well invested- my wardrobe is leaner and I can not only see the gaps but can also visualise new ways of wearing pieces from last season. Later during the day, I packed for my long weekend getaway and I could not help but throw in some cool pieces that are right on the mark this Autumn. Let me show you what to wear this Easter long weekend: 3 looks you can put together effortlessly with THIS SEASON’S TRENDIEST pieces! 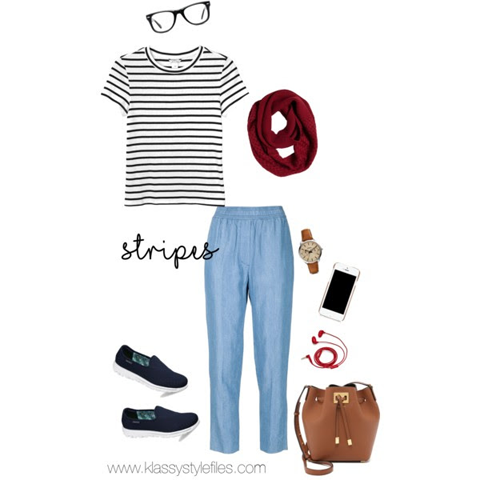 ‘Stripes + chambray’ – Can stripes ever go out of fashion you ask? Nah! I’m so glad they never do. In my view stripes are the easiest way to look chic. Teamed with a relaxed fit chambray pant and some cool accessories you will be all set in style for a long drive. Complete the look with Skechers for extra comfort, especially if your getaway involves camping! Burgundy is totally cool this season, make sure you purchase a snood or scarf in the colour for the perfect little addition to your relaxed chic look. ‘Blush beauty‘- Blush tones are oh so sophisticated! 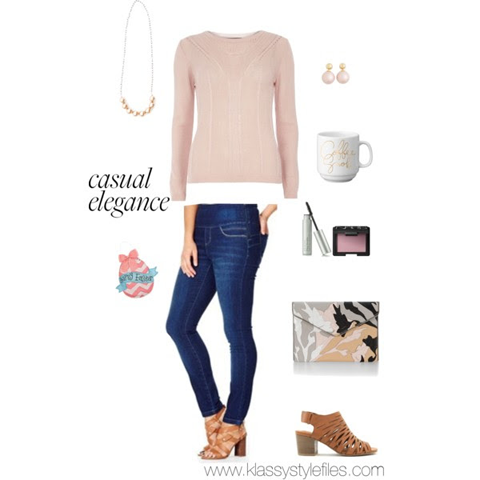 A luxurious, soft knit in blush paired with slim dark jeggings calls for the perfect Easter Sunday outfit. Heighten the elegance by adding rose gold jewels and tan peep toe heels. Add a quirky clutch in complimentary tones and the outfit will look like its straight out of your favourite fashion magazine. ‘Bohemian charm’ -The relaxed all time favourite autumn print – bohemian is back! Paisley, block prints and Indian textile patterns are popping up in stores all around and I am loving the deep warm colours. A gorgeous boho print worn with a distressed jean is the ideal combination of fashionable yet comfortable and so chic for a range of ages. Keep the make up earthy with a bright lippie and dark neutral accessories. Finish with a beige block heel for added style!